News Posted in What's On. BEARS, wolves, stags and wild boar can be found in Hotham Park, in the centre of Bognor Regis – but there’s no need to panic. They are some of the life-size props which add to the fun around the park’s 18-hole adventure golf course, Wildforest Falls. The inspiring course is designed to be both thrilling and educational as each of the animal models has a nearby information board so both young and old can learn some fun and enlightening facts about each species as they play. A beaver dam complete with waterfall and fallen log putt-through, a tree stump vortex and ‘Hotham Clock Tower’ putt-through are just some of the obstacles players will have to negotiate at this wildforest-themed attraction. As a welcome break from golf, the site offers a kiosk serving hot and cold drinks and snacks. Toilets are on site and the park’s pay and display car park is nearby. Hotham’s Park other family-friendly attractions, such as the miniature railway, boating lake, children’s playground, Alice in Wonderland sculpture trail and an ornamental pond, are all set amid the well-tended trees, shrubs, flowers and lawns – offering enjoyment throughout the year. 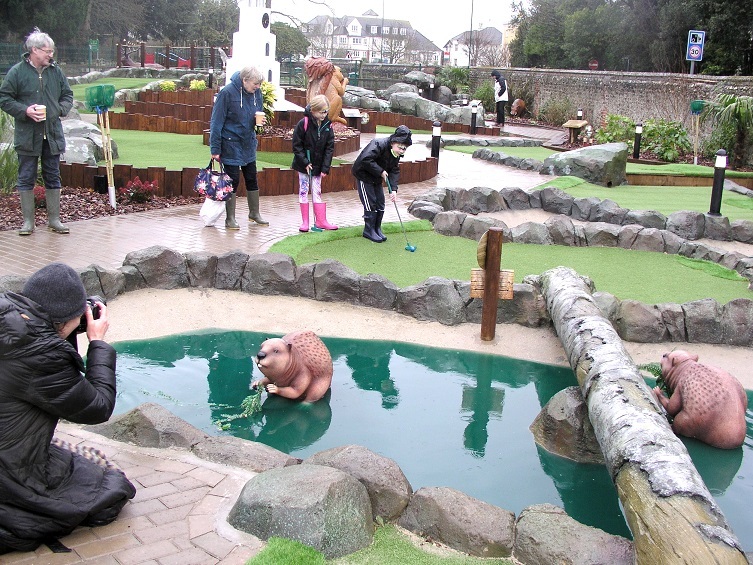 A round of Wildforest Falls golf is outdoor, sporting fun for all ages and is open Monday to Friday, 10am-4pm and at weekends from 9am. For enquiries, call 01243 830262.